This week SIGGRAPH 2017 is blasting away in Los Angeles and I can’t imagine a better place than the premier event for computer graphics to announce that Azure Batch Rendering will now move into public preview. The complexities of cinematic productions, associated workflows, and infrastructure have always intrigued me, and they are honestly one of the very best examples of the hands-on value that Azure provides. Abstracting away infrastructure considerations, deployment, and management rarely made more sense, while at the same time being able to scale beyond the physical boundaries of your on-premises environments. 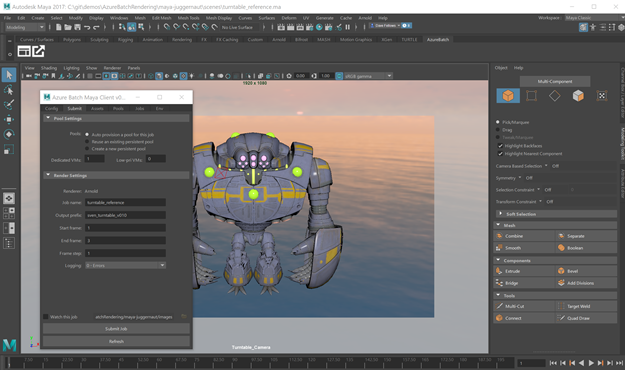 Enabling artists, engineers, and designers to submit rendering jobs seamlessly via client applications such as Autodesk Maya, 3ds Max, or via our SDK, Azure Batch Rendering accelerates large scale rendering jobs to deliver results to our customers faster. Back in May during the Microsoft Build conference, we announced the first limited preview of Batch Rendering, a milestone in integrating the high-end graphics user experience with the power of Azure. Since then, hundreds of curious and excited customers have been putting Batch Rendering through its paces and have provided invaluable feedback to us on the product – thank you! While Azure Batch Rendering with Autodesk is moving to public preview, we are also excited to announce a limited preview of V-Ray in partnership with Chaos Group. With V-Ray being supported for Maya and 3ds Max, this is another great step forward in supporting a rich and vibrant ecosystem on Azure. 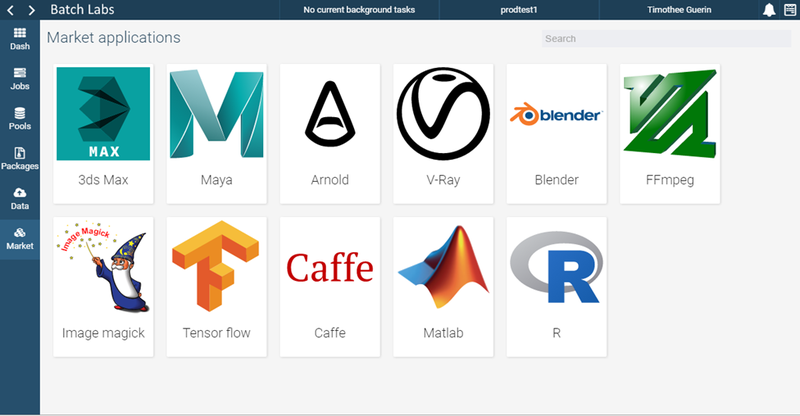 Azure will continue to work with Autodesk, Chaos Group, and other partners to enable customers to run their day to day rendering workloads seamlessly on Azure. Batch Rendering will provide tools, such as client plugins, offering a rich integrated experience allowing customers to submit jobs from within the applications with easy scaling, monitoring, and asset management. Additionally, the SDK, available in various languages, allows custom integration with customer’s existing environments. In addition to our Batch Rendering announcements, we are launching a preview of a cool new management application, Batch Labs! Batch Labs is a cross-platform desktop management tool which includes job submission capabilities as well as a rich management and monitoring experience, along with the ability to manage asset uploads and downloads. Batch Labs hosts a marketplace of supported applications which can be easily extended by customers for their own uses and custom workflows. Lastly, I’d like to invite you to come and meet our team at SIGGRAPH 2017. We’re hosting sessions and will be at booth #923, showing off a bunch of cool demos with partners like Conductor, Avid, Vizua, JellyFish Pictures, and PipelineFX along with exciting Microsoft hardware like the HoloLens and new Surface Studio. If you are in the Los Angeles area during the week, you’re more than welcome to use the promo code “MSFT2017” to register for a complimentary visitor pass to the expo floor of SIGGRAPH. Thank you all for your support in hitting this important milestone for Azure Batch Rendering. We are looking forward to continue working with you on the further expansion of the product and welcome your continued feedback! Get more information and documentation on using Azure Batch Rendering.